Only a day after the reveal of Majora’s Mask 3D, you can already preorder the game off of the North American Amazon website, and from the official Nintendo UK website, along with the European collector’s edition. No notable retailers have opened for preorders as of yet in other regions, but it probably won’t be very long. Be sure to get your orders in now! 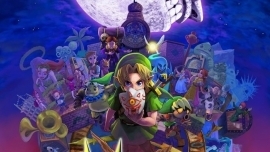 Are you going to order Majora’s Mask 3D now? Will you be buying the collector’s edition? Will you be silently sobbing because you’re not European and can’t get it? Let us know in the comments!